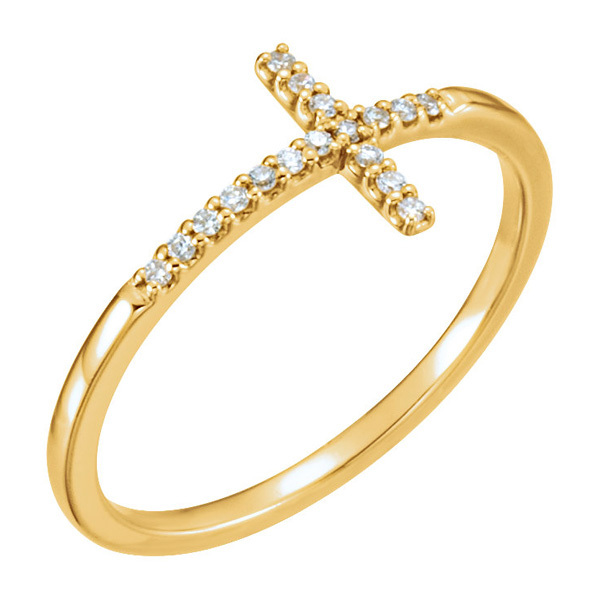 The favorite and stunning look of warm yellow gold and diamonds stand out when paired together, as seen in this 14K gold diamond cross ring for women from Apples of Gold Jewelry. This beautiful ring features a thin 1.6mm wide band, and on the face of the ring, two small arms branch out from the band, creating a cross. The 14K yellow gold ring is only made more special with the addition of seventeen diamonds. The diamonds, while adding sparkle, total 0.08 carats and are rated G-H for color and I1 for clarity. The diamonds add such a beautiful accent to the ring that you will be stunned at how lovely the look is! "Psalms 37:4 - Delight thyself also in the LORD; and he shall give thee the desires of thine heart." We guarantee our 14K Gold Diamond Cross Ring for Women to be high quality, authentic jewelry, as described above.